When this guy heard that the Pope was coming to town, he went out and bought a tuxedo in the hope that the Pope might notice him on the parade route. When he went to the parade, there was this bum standing next to him, with old, dirty clothes on. 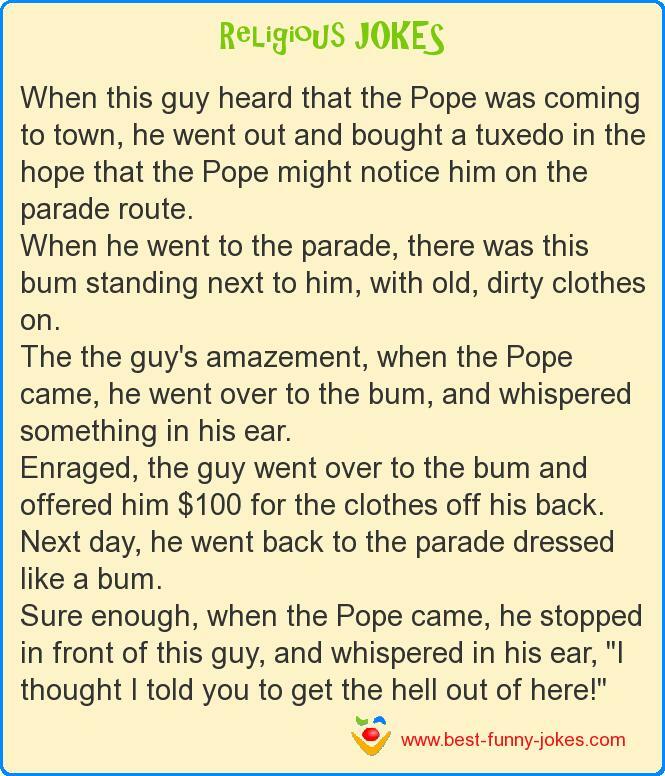 The the guy's amazement, when the Pope came, he went over to the bum, and whispered something in his ear. Enraged, the guy went over to the bum and offered him $100 for the clothes off his back. Next day, he went back to the parade dressed like a bum. Sure enough, when the Pope came, he stopped in front of this guy, and whispered in his ear, "I thought I told you to get the hell out of here!"